Watchman: Shepherds watch for enemies to the flock—Similarly, home teachers should remain vigilant for anything that could hurt the family. Protector: Shepherds protect the flock from the enemy—Do anything and everything that can protect and strengthen the family. Nurturer: Shepherds lead the flock to pasture and to water — Teach and nurture the family with love and with the word of God, and serve them with all of one’s heart, might, mind, and strength. Friend: Shepherds know the names of their sheep and the sheep recognize the shepherd’s voice—Know the names of family members, their hopes and dreams, the things they enjoy, and their concerns. Trusted guide: The flock trusts the shepherd because he has demonstrated love and concern (he cares for their welfare) — As home teachers show their love and respect for family members, they will love and trust them. Devoted servant: Shepherds will give their life to protect the flock because they have unconditional and Godlike love for their flock — That is why they feed and nurture them (see John 21:15-17). When home teachers truly love (unconditional and Godlike love), they will always nurture and bless those they have been assigned to teach. Doctrine and Covenants 20:53-55—53 &#151; The teacher’s duty is to watch over the church always, and be with and strengthen them; And see that there is no iniquity in the church, neither hardness with each other, neither lying, backbiting, nor evil speaking; And see that the church meet together often, and also see that all the members do their duty. There is no doubt that the home teacher's duty is to ensure that the members he has been entrusted with are to be nurtured and fed and watched over. Doctrine and Covenants 20:59 — They are, however, to warn, expound, exhort, and teach, and invite all to come unto Christ. Home teachers are to teach their families the word of God by the Spirit (see Doctrine and Covenants 42:14; 50:17-23) and to strengthen them in all that they do (see Doctrine and Covenants 108:7). Psalm 142:4 — I looked on my right hand, and beheld, but there was no man that would know me: refuge failed me; no man cared for my soul. Surely there can be no worse feeling than the feeling of being unloved and uncared for. Home teachers can be sure that their assigned families are loved and cared for. Doctrine and Covenants 108:7 — Therefore, strengthen your brethren [and sisters] in all your conversation, in all your prayers, in all your exhortations, and in all your doings. When home teachers build caring relationships with their assigned families, they are better able to strengthen those whom they home teach, both temporally and spiritually, in all that they do. James 1:27 — Pure religion and undefiled before God and the Father is this, To visit the fatherless and widows in their affliction, and to keep himself unspotted from the world. Are you watching over your families as you should? Are you ministering to their needs? Do you care enough about your families’ welfare that you find out their interests, that you remember birthdays and special events, and that you continually pray for them? Are you the first one to the home when the family needs assistance? Does the head of the household call on you first? Are you attentive to the needs of each member of the family? When one of your assigned families moves, do you know where they have moved? Do you make an effort to obtain their new address? Do you check with neighbors, friends, and relatives? It is my duty, as a shepherd of the flock of Christ, to warn them of the danger which threatens; and if I fail in my duty and the danger comes upon them and they perish, the Lord has said that he will require their blood at my hands, and at the hands of every other shepherd of the flock, who, knowing his duty fails to perform it. 1. Remember the doctrines, principles, and covenants that will inspire us and help us do our duty. Keep in mind the purposes and goodness of God — Recognize and remember that God’s goodness, mercy, and covenants are all centered in His children—their happiness, immortality, and eternal life (see Moses 1:39). Make charity the central strategy—Realize the power of love. As disciples we are to love one another (see John 13:34-35) and as under-shepherds we are to feed His sheep, because we love Him and them (see John 21:15-17). Focus on the Savior’s Atonement—Gain appreciation and gratitude for the Atonement. It is through the Atonement that all humankind is blessed and nurtured (see Alma 7:11-12). We become agents of the Lord to do His as He counsels (see D&C 81:5). Seek understanding—Seek to understand the doctrines and principles of the gospel. Obtain the word (see D&C 11:21). Teach the word of God and testify as to its power, which in turn can and will change lives (see Alma 31:5). Be converted—Acknowledge the power of true conversion. When one is truly converted, one has an overwhelming desire to bless and serve others (see Enos 1:9,11,16; Mosiah 28:3). Recognize the value of your assigned families—Understand the worth of souls (see D&C 18:10-16). You are responsible and accountable for the teaching and nurturing of your families (see Moroni 6:4). You are the agent for the Bishop and the Lord. You are on an errand of the Lord. Always remember what price has been paid that all might have the opportunity to return to the presence of out Heavenly Father. Build them up—Recognize the power of positive self-image. Give genuine and honest praise. Encourage them to do good and keep the commandments. Apply your faith—Increase your faith in the Savior. Your power to bless them in and through the strength of the Lord is dependent upon your increasing and exercising your faith (see Moroni 7:33). Pray—Improve your prayer habits. Pray for their well-being (see 1 Nephi 1:5). Caring—Do we truly show that we care for our families? People don’t care how much you know until they know how much you care. When you care about things they care about, they will know you care about them. Nothing is more devastating than wondering or feeling that no one cares for you (see Ps 142:4). God’s representatives—Do we recognize that we are on the errand of the Lord? As priesthood representatives we act with the authority of God—and to do what? To bless and nurture God’s children according to His will and pleasure. This is our honor, privilege, responsibility, and joy (see D&C 20:46-47, 51, 53-55) . Actual needs—Do we seek to understand the needs of family members and attempt to fulfill them? We seek to become men of a sound understanding so as to better bless the people we serve (see Alma 17:2). Supplication—Do we really pray for our families and their well-being? When we fast, do we fast and pray for our families? The prayers of the righteous are answered in behalf of others (see 2 Chronicles 30:18; Enos 1:9, 11, 16; Mosiah 27:14; Alma 6:6; 10:23; 3 Nephi 12:44). 3. Seek to make home teaching an act of joy for yourself and your families. Be early—Call and make appointments early in the month. This shows you care. Note the milestones—Remember birthdays and special days in the life of family members. Simple gestures and treats can have a wonderful effect. Recognize accomplishments—Find out about any success or honors that each family member has received and seek to praise and encourage each one so honored. If it has been published, bring the newspaper. Know their preferences—Learn of their favorite foods, hobbies, and things they like to do, and then surprise them with a simple gift of relevance. Follow the Spirit—Above all, invite the Spirit to direct you and in turn bless family members according to their needs. Use initiative—You and your companion can have fun making your own list with wonderful and exciting things to do. The Savior bore testimony—“Behold, I am Jesus Christ the Son of God” (9:15). The Savior taught only the fundamentals of the gospel—See 11:31-41; 17:20; 27:13-21; 15:1. The Savior brought enduring gifts to the people—Peace, light, love, and life (17:21-25). The Savior brought a life-changing influence—“Old things are done away, and all things have become new. Therefore, I would that ye should be perfect even as I, or your Father who is in heaven is perfect” (12:47-48; 27:27). The Savior taught us who we are—“The sons of God” (9:17); “the children of your Father who is in heaven…” (12:45); “the children of the prophets…the children of the covenant” (20:25-26). The Savior taught us how to gain a fullness of truth—“[G]o ye unto your homes. and ponder upon the things which I have said, and ask of the Father, in my name, that ye may understand, and prepare your minds for the morrow” (17:3). The Savior taught us how to participate in the ultimate fulfilling of the Father’s covenant with the house of Israel—“And then will I gather them in from the four quarters of the earth; and then will I fulfil the covenant which the Father hath made unto all the people of the house of Israel” (16:5). The Savior taught us how to endure to the end—“…give heed unto the words of these twelve” (12:1); the sacrament (18:1-14); “watch and pray always” (18:15); “Pray in your families” (18, 21); “meet together oft” (18:22); “[H]old up your light that it may shine unto the world” (18:24); read the scriptures (23:1, 5; 23:8-14); pay tithing (24:10). “The leaders of the Church expend great effort to see that priesthood home teaching works. Though it is much taken for granted, it is always provided for and always will be. The principles of it have never changed, not with changing society or the various additions to programming in the Church. Without it the Church could very quickly cease to be the Church. And I say again, though some activities may be more inviting, none is more important.” —Boyd K. Packer (“The Saints Securely Dwell,” Ensign, Jan. 1973, 88). “As the Savior declared to us, ‘I will call you friends, for you are my friends.’ [D&C 93:45.] A friend makes more than a dutiful visit each month. A friend is more concerned about helping people than getting credit. A friend cares. A friend loves. A friend listens. 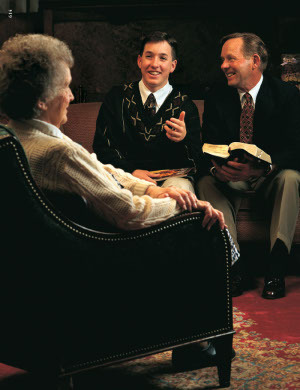 And a friend reaches out.” —Thomas S. Monson (“Home Teaching—a Divine Service,” Ensign, Nov. 1997, 46). This page was last edited on 26 September 2010, at 13:45.